Proud husband Lee Jensen of Mammoth Lakes sent us this picture of his wife Sara with her 29-inch wide 6x7 mule deer she killed in the special G3 hunt in California. She made a beautiful shot at 300 yards with a Remington .243. 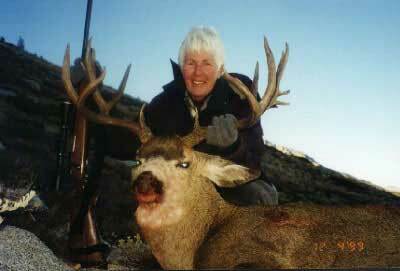 Sara was the high bidder on an Open Zone deer tag at the Rocky Mountain Elk Foundation fund-raising dinner in Sacramento, California in 1999.